It is not often that one discovers a lifelong passion at a young age, but Preston Miller found his at the age of 11. 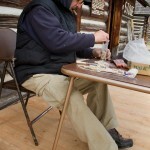 Miller, 72, was just a boy when he collected his first Native American artifacts in Pennsylvania. The buildings on his Mission Valley property today are full of objects he has gathered over the years. 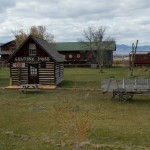 Some of the structures that house his collectables are artifacts themselves, such as the old Ravalli train depot. 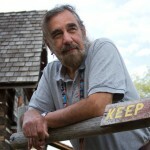 Miller has relocated several of the area’s historical buildings and log structures to the land where he lives and does business. 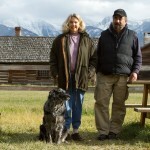 Miller and his wife, Carolyn Corey, own and run Four Winds Indian Trading Post, located three miles north of St. Ignatius, just off Highway 93. 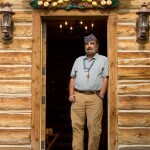 He opened his first store in Arlee in1970, three years after moving to Montana. He opened Four Winds after the shop in Arlee closed. 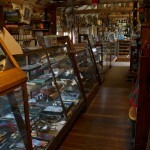 Besides selling authentic artifacts, Miller offers customers books about Native American history and culture. They include some that Miller and Corey wrote themselves about collecting and how to spot the difference between authentic artifacts and replicas. 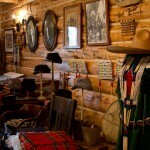 Four Winds is different, Miller said, because everything sold there is made by traditional methods. Miller makes some of the items himself because fewer people today know how to make them. He said he used to employ several Salish and Kootenai elders to make items like traditional beaded moccasins. But when these skilled artisans died or were no longer able to work, there was no one to replace them. The store’s busiest time, Miller says, is during the summer when tourists are abundant. Business slows dramatically when summer ends, but Miller stays busy making tobacco pipes and games to sell in the store. And there is his personal collection to tend. With all the items he has gathered, there never seems to be a shortage of something to do. 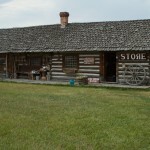 And if the trading post finds itself a customer, the office is just a walk across the yard.